When you say Filipino food, one of the first dishes to come up is Adobo. For non-Filipinos, it seems to be the one dish that is synonymous with Filipino food. And why not? With its tempting salty-tangy flavor, it’s not a dish that’s easy to dislike, no matter what flavors your palate is used to. So it’s only proper to include an adobo-centric bento for Lasang Pinoy’s Make your Own Bento challenge, right? My second take for this round’s challenge is a bento that spotlights adobo. Both as a viand and as a rice fixing. In the upper left corner is a healthy helping of adobo flakes, prepared from a commercial, ready-to-cook brand. Below it are some mini-onigiri in cute shapes. These were prepared with freshly cooked koshihikari Japanese rice, slapped into onigiri rice molds, with some more onigiri flakes in the middle. At the lower right corner is a helping of fried Daing na Bisugo, a dried fish dish. Daing is a process of preserving fish by salting, then sun-drying. It tastes best with some vinegar, so I packed some in the little strawberry-shaped sauce container. Above the daing is a small salad of grilled eggplant, red onions and bagoong, or fermented shrimp paste. This is an excellent complement to fried fish, offering a slippery, crunchy and lightly-flavored contrast to the salty fish. Lastly, I also added some cucumber slices and tomato wedges to serve as a refreshing contrast against the flavorful pork and fish, and a teddy bear-shaped hardboiled egg to pair up with the adobo flakes. In hindsight, this bento needs more rice because there was a lot of adobo and daing to go around. And while it seems like a large helping of lunch, I actually finished it! It’s either because I was really hungry that day, or the combinations were too nice to pass up. This entry was posted in bento, blog carnivals. Bookmark the permalink. i just had lunch but your bento makes me want to rush to the grocery and buy those ready cook adobo flakes.i always depend on my father’s cooking. Wow this is really nice. Nakakagana rin talagang kumain pag maganda ang presentation! It was! Magbento ka na ulit, panalo yung Mom’s Kitchen Adobo Flakes. Just don’t follow the package instructions (pasaway :P) and fry it in more oil than the 1 tbsp the package directs for a really crispy adobo. You’re lucky your father cooks for you. Despite all the comforts of ready to cook / ready to eat food, nothing beats home cooking. Thanks! I have to agree, a large part of eating is tasting with the eyes. Adobo flakes and onigiri? Sarap! Adobo is an all-time favourite Pinoy dish so I am not surprised to see adobo-centric entries for this round! Great entry, Kaoko! Thanks for joining LP25! 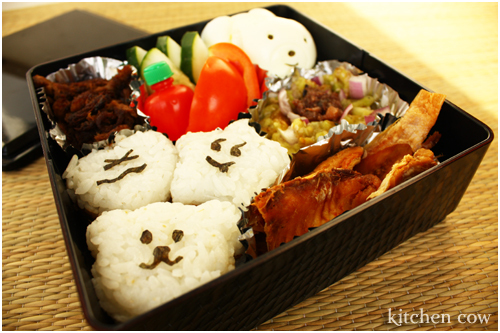 i really love how you arrange your bentos. Daing! May nabibilhan ng daing sa inyo? I guess it's one of the fortunate effects of globalization. I for one, can't imagine not being able to eat stuff like tuyo and daing when I want. Thanks dood! Hehe, bento convert ka na rin?